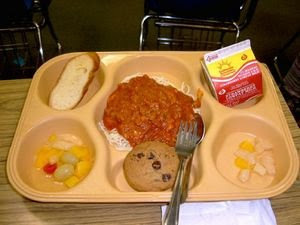 Contents: Spaghetti, chocolate chip cookie, fruit cocktail, slice of French bread, milk. Notes: Getting all your food groups, but there are definitely better alternatives to fruit cocktail. Also, where is the garlic butter for the bread. That's sacrilege.